There was never a question about cutting back on things like cable television and evenings out. We could cut our heating bill down even further. Cheryl keeps us at a balmy 63 degrees through most of a chilly Montana winter to save on money. What’s a few degrees chillier? We’ll wear sweaters inside. But to skimp on food is a crime against your soul. I’ve been re-reading Vonnegut’s “Slaughterhouse Five.” Even in the midst of an apocalyptic C.S. Lewis-like, science-fiction novel, there are references to good food. The “Jerrys” eating sausage with wine goblets brim-full on board the guard’s boxcar is a prime example. The difference between a defeated soul versus a winning soul. Or the intermittent confusion of the two at any given time in the war. One of the reasons that concentration camps worked so well is that the gruel they fed people dispensed with the very fuel for their souls. That’s right, food, and good food, is the very fuel of the soul. That inspiration that makes one want to write descriptors that tantalize the salivary glands, those tenuous body part connections that make us human to our very core. On Friday afternoon I sat at the K-Hole south side location sipping on a big barley wine. The tropical fruit notes of which could make an islander homesick. I was reading through the Missoula Independent and noticed a Good Food Store ad for Venus clams at $2.99 a pound. Venus clams in wine, shallot and garlic sauce with Le Petite bread. 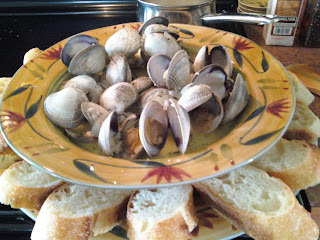 Laid off and looking for work makes a man think about every penny he spends, but there are deals that enliven the heart and mind, and a good plate of clams steamed in wine, shallots and garlic with a crusty local bread sounded like heaven after raiding the pantry and cupboards for year-old canned soup and Top ramen this past week. Celebration is something no human should ever skimp on. And celebration is not a yearly thing tied to one’s birthday or the Christmas holiday. Celebration is the life of any human event that merits it. Success and even failure constitute celebration. The gathering of good people, the imbibing of good drinks and the preparation and presentation of great food are integral to our happiness. A man can be delighted in the beauty of a woman and the joy in her company, but there is no mistaking why they say the way to a man’s heart is through his stomach. Food is the fuel of the soul. Want romance? Food is often necessary in the accomplishment of that. To live well is to be well, and living well need not be tied to your monthly wealth statement. Eating well is tied to how much knowledge you have about the food around you and where to seek delicacies that are seasonable and tasty and low cost. Many do not know or understand this art, having lost it to the yellow bouncing Wal Mart smiley face many years ago. When you are cut off from your source of income and stability, it becomes increasingly desirable and even stylish to cut back on what you consume internally. This leads to a depletion of the soul, which feeds on the goodness of others, fellowship with the Creator and good food. I know this. If the soul is depleted, the spirit goes with it, for the two are inexplicably tied together. One must feed himself and his family to maintain health and vitality and a positive view in the face of all the trials associated with life. I believe this. Food should be the last thing anyone cuts back from. Want to know how to fix a broken society? Feed them good food and make them believe in themselves again. Want to fix a broken-down unemployed man? Feed him and cause him to believe in himself once again. So it goes.